Mike Ferrara, owner of Ferrara Photography, calls himself "a horseman who takes pictures." 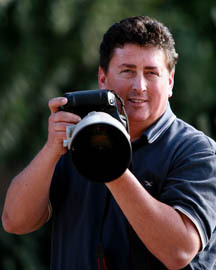 As a lifelong admirer and exhibitor of Arabian horses, Mike feels his experience as a horseman is important to top quality photography as the lens, film, setting, and lighting. "I've raised, trained, and shown horses, so I know what constitutes a favorable pose or flattering angle for a show horse-and I can identify with the thrill of a Nationals win picture or the excitement of capturing an exceptional foal on film," Ferrara explained. Born and raised in Los Angeles, Mike Ferrara met horses and photography at a young age. His father bred and showed a few Arabians, and the aspiring horseman/lensman talked his dad into buying a camera and paying for film in exchange for "...lots and lots of horse pictures," he recalls with a laugh. "I was a very frustrated photographer until I attended a photo clinic with Jerry Sparagowski in 1984. I learned so much from him-about equipment, horses, and people!" Ferrara's admiration for Sparagowski's work has come full-circle, as the two renowned photographers have now collaborated on major Arabian shows including U.S. Nationals, Youth Nationals, and Scottsdale. Mike's favorite shots are action photos of English horses, but he enjoys all facets of his job. Shooting at horse shows is like combat training, there's so much time pressure, it's exciting. Doing farm shoots is great, because I have more freedom to indulge in my creative side, to capture the more subtle beauty of horses in a relaxed setting. And special-portrait work, magazine and catalog work is always fun too," he said. When Mike's not capturing horses on film, he's likely to be indulging his passions for sports, music, and enjoying "anything my kids want to do." "I have the best of both worlds," Mike feels, "because I get to work with people I really like and with horses, and have time for being a dad too."